Let Hangsterfer’s expertise guide you to choosing the right fluid for your needs – or even designing one to fit your specific requirements. Hangsterfer’s Laboratories, Inc. researches, develops, and manufactures the Next Generation® of metalworking fluids and lubricants in our ISO 9001 approved facility in Mantua, New Jersey, USA. 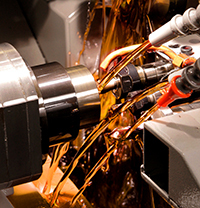 Our full product line includes emulsifiable oils, semi-synthetics, synthetics, straight cutting oils, drawing and forming compounds, EDM fluid and machine lubricants made from highly refined, ultra-pure ingredients. All of Hangsterfer’s products are formulated with advanced technologies, which utilize synthetic, vegetable and petroleum components. Improve your surface quality and tool life when machining, grinding and forming aluminum, chrome, nickel, Stainless Steel, titanium and their alloys by using Hangsterfer’s Metalworking Lubricants. We also offer a complete line of Total System Partnership® (TSP) equipment which offers basic yet functional equipment that aids in both the use and longevity of metalworking fluids. Since our lubricants are engineered to be recycled, it makes sense to partner them with basic fluid management equipment. Adding TSP products to your operations will help reduce fluid related costs.